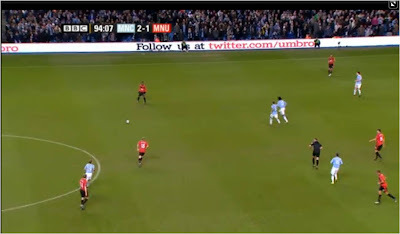 Tonight Manchester City played Manchester United in the semi-final first leg of the Carling Cup. The game was shown live on the main BBC channel BBC1 and during the game a digital ad hoarding surrounded the pitch and updated regularly. One of the advertisers was Man City kit producer Umbro. The Umbro ad would finish with a message 'Follow us at twitter.com/umbro'. This was shown every few minutes throughout the game and was shown to both the crowd in the stadium and the BBC viewers at home. This is another example of an advertiser using traditional media (with a great opportunity to get additional eyeballs through the TV coverage) to drive traffic to a social Destination. 'Follow us on Twitter' and then we'll bring you closer to our brand by maintaining a regular dialogue with you. Hey Nick, I noticed this too and tracked changes in Followers. The answer is - not very many.